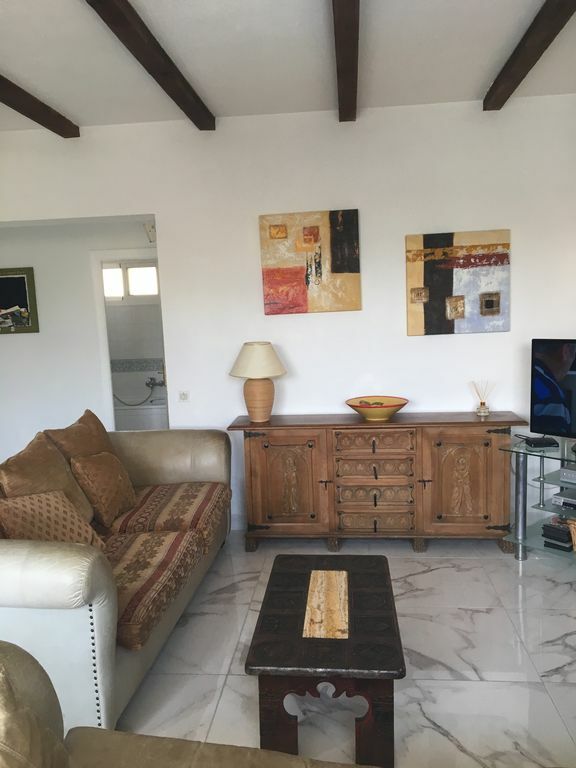 Comfortable Spanish style 4 bedroom, 3 bathroom villa with private pool. Only 1 minute walk to beach. Situated in a peaceful and quite setting in Marbesa. This villa is ideal for those who enjoy privacy but also like to be near a bustling nightlife. Area surrounded by golf courses. Air conditioning in all bedrooms and lounge. There is a patio with a outdoor sofa and two armchairs together with a dining table and chairs. My husband and I live in Northern Ireland, we have two sons ages 23 and 34, one cat and one dog. We used to own a property in La Reserva on the other side of the Caraterra. We often walked to friends who lived in Marbesa and as we walked along the roads down through Marbesa to the beach we decided Marbesa was where we wanted our holiday home to be. We viewed several villas in this area but fell in love with Villa Mimosa, the family who owned the villa before us had used it as their holiday home since their children were very small and who were now grown up. As soon as I walked into the villa I had a feeling of being at home. We love this area in Marbesa it really is the beach life with restaurants and shops within easy walking distance. Most of our clients comment on how comfortable the villa is to live in and they almost certainly could stay for a few months!! The pool obviously is an added bonus and many of our clients have enjoyed endless hours of fun in the pool with their children and of course the bigger children sunbathing beside the pool sipping some sangria or if the girls go for the weekend, its bubbles all the way! En-suite bathrooms to master bedroom and 2nd bedroom up stairs. Main bathroom on ground floor. Fully fitted kitchen with dishwasher, fridge, microwave. Area surrounded by golf courses. Notes on accommodation: Air conditioning in all rooms Outside: Large patio with steps leading down to private pool. Utility Room: Washing machine in kitchen. Cleaning / Towels / Linen / Maid service: Linen and towels provided. Option of cleaning service once a week by request. Only 2 minute walk to the beach which has a number of bars and restaurants. The beach can be stoney in parts. Nearest Airport Malaga International. Villa only 35 mins drive from airport. Only 5-10 mins drive to all amenities. Villa Mimosa is close to Elviria which has numerous restaraunts, bars, banks and supermarkets, 5 minutes drive. The famous Niki Beach is within walking distance. The port of Cabapino is within walking (15 mins) distance along the beach, in Cabapino you can enjoy the various restaraunts and bars. There are two supermarkets within walking distance of the villa.